The moment I said yes to marrying my husband, I knew that from then on, we were a team. He's the most hardworking man on earth, and seeing him doing everything on his own from sun up to sun down was pretty heartbreaking. I kid you not when I say that he takes about an average of 50 phone calls a day, from clients wanting this and that, to government stuff, to supervising repairs on units, to new inquiries, down to marketing his current listings. It's just too much for one person to handle. So one day, I asked him out of the blue: "What if I quit my job to help you out? Do you think that's a good idea?" His eyes glistened, mouth widened, and said: "That would mean the world to me." And that, my friends, was all I needed to hear. TEAM PINK. 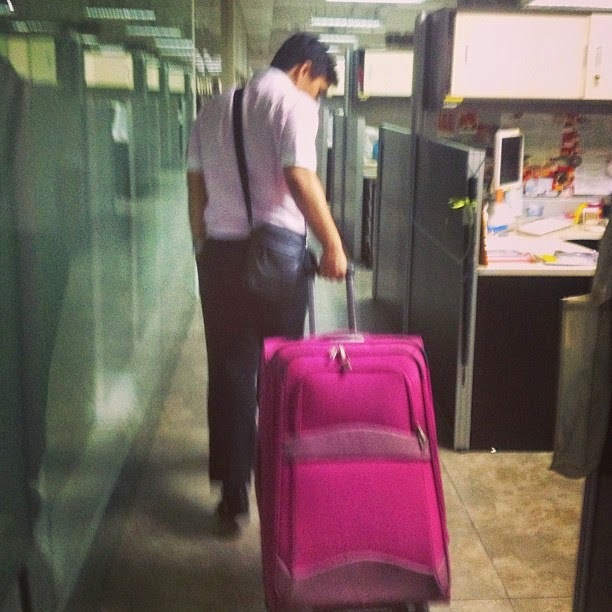 This photo was taken April 2013 during one of my typical all nighters where my husband eagerly picks me up and my signature pink rugged luggage filled with clothes and shoes from a shoot. He has always been so supportive of my fashion career since day one and I love him for that. It's been three months since I left my desk job and I gotta say, it's been great so far. Aside from being able to create some sort of work-life balance in our relationship, I get to understand and be with my husband more. Before, I just can't seem to fathom why he's so tired and stressed all the freaking time, and now that I get to experience handling difficult clients, I seriously get how this job can totally drain you. Plus, we get to earn more! But that's just the icing on the cake, really. I think the best part about my decision is that I am learning something new every day. SALUTE. 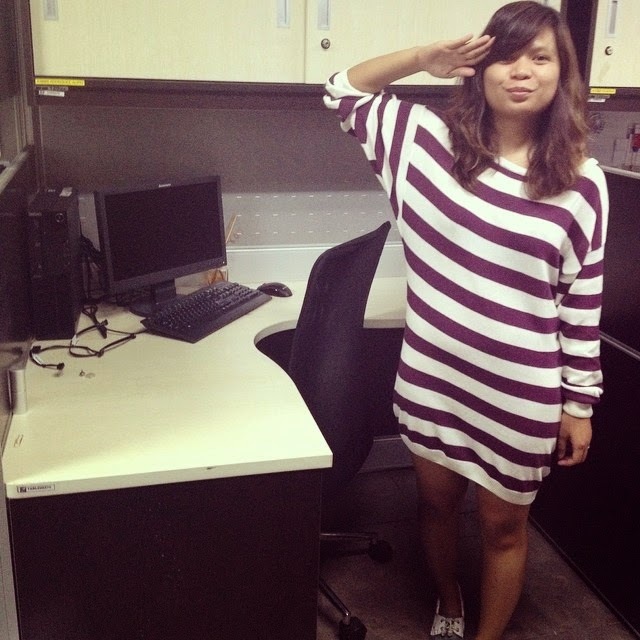 Me and and empty desk on my last day as a Fashion Editor. Photo taken April 22, 2014. So yes, I may have given up a career that really love, but I am certain that I am in the right place, at the right time. Fashion will always be my first love and nothing can ever change that. Who knows, maybe someday I can do something fashion-related again for a living, or better yet, just become a super rich lady who can shop all day and all night. HA! I kid, I kid.